This custom cookbook is chock full of delicious recipes from club members. See more cookbooks created by club members. Spring is just around the corner and Jello recipes are common in every household. Here are some of the most delicious various recipes of Jello or desserts using jello in the recipe. 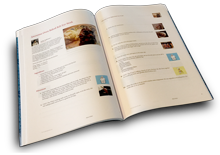 Order a professionally printed, perfect bound cookbook with a full color glossy cover and 50 recipes. You ALWAYS do such beautiful work! Thanks for including my Mama's Seafoam Salad in your cookbook. Wow... never knew you could make so many things with Jello. Guess i will have to rethink jello as a good thing in my recipe book. Love Jello recipes so many different ones as well, perfect Karla ! Awww. . . I see your at it again, Karla, . .Thanks for using My recipe in your Jello book. Good idea. Thanks Karla for including my recipe. I love your book.